In our ongoing efforts to help our users pick out the very best in entertainment at a glance, we have added a “Must-Play” designation for our highest-scoring games, representing those releases deemed by a consensus of top professional game critics as truly exceptional. 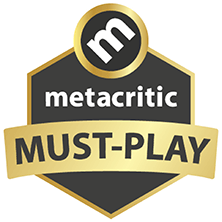 We designate a game as “Must-Play” when it achieves a Metascore of 90 or higher and has been reviewed by a minimum of 15 professional critics. You’ll notice our new badge (pictured, right) on games meeting these requirements throughout the site. How elite are these games? It turns out that just over 4% of eligible games in Metacritic’s database qualify for “Must-Play” status.